Food Adventures of a Comfort Cook: So, What's with the Potatoes? So, What's with the Potatoes? On Saturday, August 5, 2017, I attended another lecture at Edge of the Cedars Museum; topic being, "The Four Corners Potato". This interesting and informative lecture was delivered by Dr. Lisbeth Louderback, Curator of Archaeology and Dr. Bruce Pavlik, Director of Conservation; both of University of Utah in Salt Lake City. 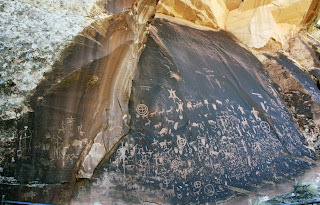 During an excavation of ruins in the Escalante Valley (aka Potato Valley and now you'll find out why the nickname), residue was found on manos and metates (used for grinding grains). After carefully wrapping the artifacts, individually in plastic, to avoid contamination, the residue was genetically tested. Imagine the surprise of finding starch granules, not of wheat or corn, but from a species of potato! Sorry Idaho, but looks like the ancestral Puebloans of Utah were one up on the potato industry approximately 11, 000 years ago. 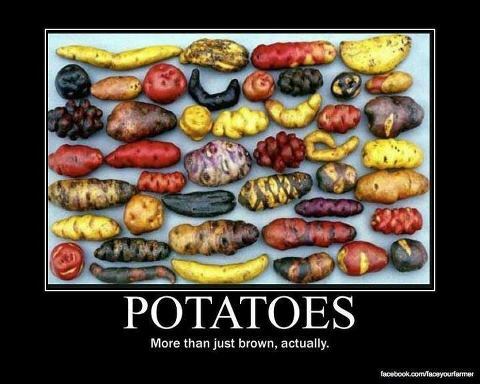 Question though, were the potatoes always here or brought up through Mexico and traded for? Exploring the landscape surrounding the ruin site, plants of Solanum jamesii were found growing and thriving. To answer the question just asked, studies were done extensively throughout the 4 states of Arizona, Colorado, New Mexico and Utah; this species seemed to be only growing in the 4 Corners region. San Juan County, Utah? Correct! Thriving plants can be still found in the Newspaper Rock area, so stay on the path when hiking around and don’t trample the plant life. Let me get back to the question of, "So, What's with the Potatoes?" This was asked of me by another attendee of the lecture who didn't understand why I was there. First off, it concerns a food item, not just of this region, but potatoes, and who doesn't enjoy those? Secondly, being able to input historical information into food articles gives the reader more "brain food". These tubers may be tiny (average size equal to adult thumbnail), but they are powerful in growth and nutrition; think of them as little superheroes. Drought and disease resistant; the plants are intelligent as they wait for monsoon season to provide needed moisture. In one experiment, a plant placed in a ten gallon container produced over 100 delicious spuds. S. jamesii has twice the amount of protein, zinc and manganese; and 3 times calcium and iron of the common potato (S. tuberosum) sold in markets all over the USA. Slight evidence has been found of a compound within the potato that may effectively be used as a preventative and/or curative for cancer. How did the ancestral Puebloans process, store and eat S. jamesii? Roasted (residue found in cooking pots), boiled unpeeled and eaten as is, sometimes raw, or placed into niches of the pueblo walls, dried, then ground into flour. Need more modern day techniques and recipes? San Juan Record carries a book to help you out, The Forgotten Skills of Self-Sufficiency used by the Mormon Pioneers by Caleb Warnock. Interacting with the local Natives, the pioneers needed to learn from them; what was safe to eat, how to grow and harvest; definitely how to cook and store for the harsh winter ahead. At Edge of the Cedars Museum, Wild Plants and Native Peoples of the Four Corners by William Dunmire and Gail Tierney is a wonderful guide of the knowledge the ancestral Puebloans passed down to their modern descendants. Which brings me to the 4 Corners Potato Stewardship Program (yes, the Cokenour family did sign up) to help propagate and grow these wild potatoes. While Solanum jamesii thrives in the other three states, often on Navajo, Hopi and Zuni reservation land, it is at a critical point of extinction within Utah. Whether a small space gardener, like our family; major landowners; even farmers with ample fields, stewards are needed to keep this food source viable. Here is another way for the stewards of San Juan County to show how residents protect our land!